A vacation in Shimla is really an enjoyable treat to oneself and family. We had the experience and it was wonderful. In my previous post, I mentioned the great things about Shimla and its immediate surroundings. The only issue we had was the dizzying trips by car to every place that we had to visit. The trip from Chandigarh to Shimla by road is about 120 kilometers, but the trip takes about 3 and half hours on an average day. The reason is that after 15-30 kilometers, winding Ghat roads reduces the average speed of travel. Moreover in lot of spots there is no protection from a slide down into the valley. Hence driving around Shimla is a big challenge. There is no relief of stretches of straight road. The curves are next to each other swinging left and right, which could make people dizzy. Anyone with motion sickness is likely to have problems from a trip of Shimla, unless the drives are spaced out in time. So, prepare for this aspect of Shimla. 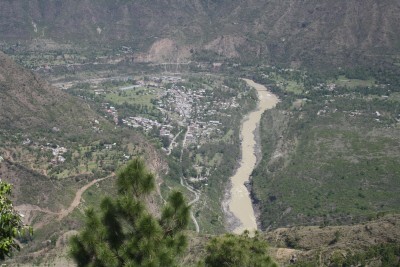 Shimla to Tattapani (location for rafting and hot sulphur springs) is about 60 kilometers and takes 2 to 2.5 hours. Narkhanda trip (about 70 kilometers each way) takes about 2.5 - 3 hours. A visit around Shimla and nearby scenic spots is an all day affair with about 40-50 kilometers of road travel, but spend about 4 hours in the car! Any visit to important picnic, tourist spots has to involve hours of driving through winding Ghat roads. Even return from Shimla to Chandigarh takes about 3 hours in spite of it being downhill. Prepare for this aspect, eat less if you are affected by motion sickness, space out your road trips, etc., if you would like to enjoy a great vacation in this awesome place within India. Shimla - why can't South India be like it?